I have experienced several firsts in Korea thus far. I walked into a two-story, 120-seat Dunkin Donuts. I watched Starcraft played on television, with announcers. I used an electronic bidet. And now I can add living through a typhoon, what they call a hurricane in the Western Pacific, to my list. Once a category 4 hurricane, Typhoon Bolaven lashed Okinawa with 150 km/h winds and buckets of rain, then looked poised to take near direct aim on Seoul today. Flights were cancelled, schools were closed, and the U.S. Embassy shut down. 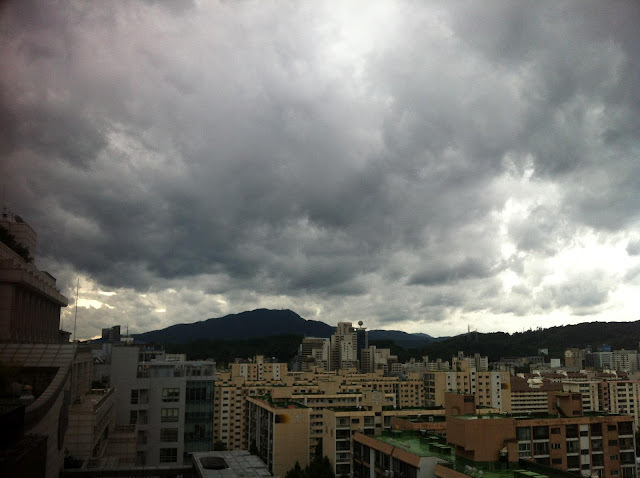 My Korean language classes were cancelled for the day as well, so I set up a view of the storm from my 18th floor room at the hotel in which I am staying. And...a whole lot of nothing, really. Not a ton of rain so far, it seems. Definitely windy but besides a stray plastic bag I haven't seen anything flying around. I won't taunt Mother Nature as I'm sure this storm could have been much worse, but I was disappointed with the intensity of this storm given all the buildup. Well, I won't have much time to bask in the glory of surviving my first typhoon experience as typhoon #2 (Tembin) is already approaching later this week! Had another first this week – screen golf! Golf is super popular in South Korea – there are two golf channels on TV here (one for men and one for women) – but given the constraints on land in this country (50 million people living in a place about the size of the US state of Indiana), playing golf on an actual course is expensive. On average, it costs $295 to play a round of golf here! Hence, the booming popularity of screen golf, which cost us about 1/10th of that. The game is sort of like Wii Golf, except you play with actual clubs and real balls. You can play a wide variety of famous courses...we tried Pebble Beach...and as you slam a ball from a driving range mat into a screen a computer measures the speed and direction of your club face to determine where the ball should fly in the game. It's not wholly realistic – you can't really simulate a bunker shot well – but my typical late-round slice off the tee kicked in, and also just like real golf I became quite frustrated by about the 16th hole! Plus with no heat stroke or sunburn to worry about, no lost golf balls, and an attendant who continually brought us drinks and snacks, I think my screen golf experience was a big win! Finally, I celebrated my 30th birthday on Saturday. Celebrating a birthday in a new place can be hard as you aren't able to ring in the special day with many of your old friends. That said, I had a delightful evening with many of my new Samsung colleagues. We went "Gangnam Style", partying in the now-famous Gangnam district in Seoul. Though we ate Turkish food for dinner and strangely did not guzzle any soju, we were able to introduce some Korean flair to the festivities with a late-night visit to a karaoke room! (노래방, or norebang in Korean) With all the new experiences of the past three weeks the gravity of the end of my 20's hasn't really sunk in, but being a little older may work to my advantage in Korea, a place still heavily influenced by Confucian principles. Glad you're all safe. Also, great shot of the cloudy sky there!